More than 60 moons orbit Saturn and by combining data from NASA’s Cassini mission with modeling techniques, scientists have so far been able to identify one with planet-like qualities. 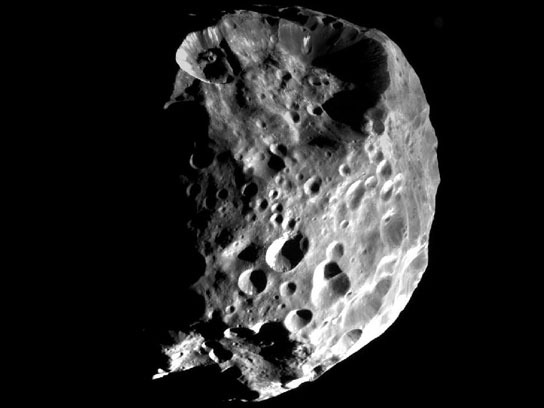 Saturn’s moon Phoebe was believed to be a so-called planetesimal, a remnant planetary building block actively evolving for a time before it stalling out. PASADENA, California — Data from NASA’s Cassini mission reveal Saturn’s moon Phoebe has more planet-like qualities than previously thought. Cassini images suggest Phoebe originated in the far-off Kuiper Belt, the region of ancient, icy, rocky bodies beyond Neptune’s orbit. Data show Phoebe was spherical and hot early in its history, and has denser rock-rich material concentrated near its center. Its average density is about the same as Pluto, another object in the Kuiper Belt. Phoebe likely was captured by Saturn’s gravity when it somehow got close to the giant planet. Saturn is surrounded by a cloud of irregular moons that circle the planet in orbits tilted from Saturn’s orbit around the sun, the so-called equatorial plane. Phoebe is the largest of these irregular moons and also has the distinction of orbiting backward in relation to the other moons. Saturn’s large moons appear to have formed from gas and dust orbiting in the planet’s equatorial plane. These moons currently orbit Saturn in that same plane. “By combining Cassini data with modeling techniques previously applied to other solar system bodies, we’ve been able to go back in time and clarify why it is so different from the rest of the Saturn system,” said Jonathan Lunine, a co-author on the study and a Cassini team member at Cornell University, Ithaca, N.Y. Analyses suggest that Phoebe was born within the first 3 million years of the birth of the solar system, which occurred 4.5 billion years ago. The moon may originally have been porous but appears to have collapsed in on itself as it warmed up. 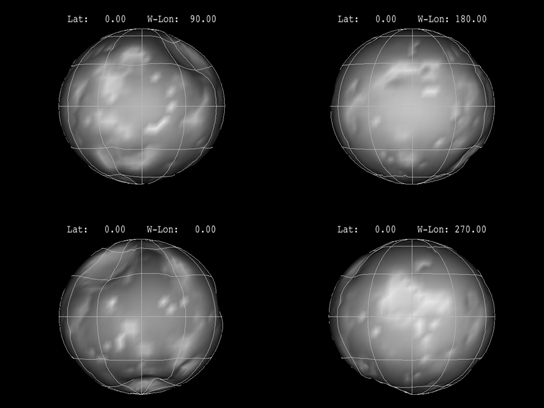 Phoebe developed a density 40 percent higher than the average inner Saturnian moon. Objects of Phoebe’s size have long been thought to form as “potato-shaped” bodies and remained that way over their lifetimes. If such an object formed early enough in the solar system’s history, it could have harbored the kinds of radioactive material that would produce substantial heat over a short timescale. This would warm the interior and reshape the moon. “From the shape seen in Cassini images and modeling the likely cratering history, we were able to see that Phoebe started with a nearly spherical shape, rather than being an irregular shape later smoothed into a sphere by impacts,” said co-author Peter Thomas, a Cassini team member at Cornell. Phoebe likely stayed warm for tens of millions of years before freezing up. The study suggests the heat also would have enabled the moon to host liquid water at one time. This could explain the signature of water-rich material on Phoebe’s surface previously detected by Cassini. The new study also is consistent with the idea that several hundred million years after Phoebe cooled, the moon drifted toward the inner solar system in a solar-system-wide rearrangement. Phoebe was large enough to survive this turbulence. More than 60 moons are known to orbit Saturn, varying drastically in shape, size, surface age and origin. Scientists using both ground-based observatories and Cassini’s cameras continue to search for others. The Cassini-Huygens mission is a cooperative project of NASA, the European Space Agency and the Italian Space Agency. JPL manages the mission for the agency’s Science Mission Directorate in Washington. The California Institute of Technology in Pasadena manages JPL for NASA. Be the first to comment on "Saturn’s Moon Phoebe has Planet-Like Qualities"